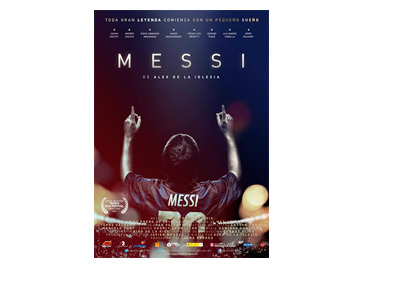 The movie titled 'Messi', directed by Spanish director Alex de la Iglesia and scripted by ex Argentine player Jorge Valdano, will be released in Spain on January 1st, 2015. The movie was shot in the cities of Buenos Aires and Rosario and it covers life and the brilliant career of the four-time Ballon d'Or winning Argentine striker, Lionel Messi. The early years of Messi are dramatized, starring Juan Ignacio Martínez as little D10S, while the rest of the movie uses archived footage, interviews and family recordings. The movie got it's world premiere in Rio de Janeiro last July during the World Cup and it was also shown at the Venice Film Festival. The film shows how Messi broke into the Barcelona first team to play alongside Ronaldinho, as well as his struggles to repeat the club form for the Argentina national team. The movie features several of Messi's teammates: Gerard Pique, Mascherano and Andres Iniesta, as well as his former coach Pep Guardiola. Also appearing are Johan Cruyff, César Luis Menotti, Jorge Valdano Alejandro Sabella and Diego Maradona. The movie is produced by Mediapro and it is being distributed in Spain by Avalon. In case you are wondering, 'Ronaldo, The Movie' is currently in production.